The Siamese Terrorist is about to have a problem. Sammy (No!) 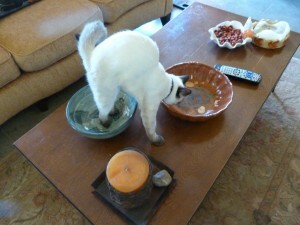 or Samino as I call him, has adopted a bowl in the house as his very own. And it’s easy to understand why. Once his got familiar with his surroundings, Samino decided this was his sleeping spot. I assume he wanted to always make sure he had fish around. Actually, the vet told me that Samino has an above average temperature. It’s 102. If I had a 102 temperature, you’d need to throw me in a rubber room because, with my below-normal 97.2, I start seeing things when my temps goes over 101. Enough. This is about The Siamese Terrorist, not me. 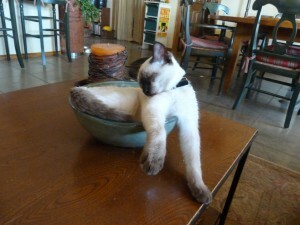 So Samino decided to sleep in this bowl – on occasion. You can never really figure out what a cat’s going to do next. …though some days he chose to do something cute like this. I guess so I’d take his picture. 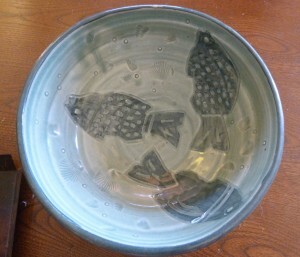 But lately I’ve been noticing that he is outgrowing his fish bowl. I knew the day would come that if it just didn’t fit anymore, he’d be the kind of cat that would start sleeping in the sink. Cat hair in a sink is not a good thing for a near-sighted contact lense wearer. 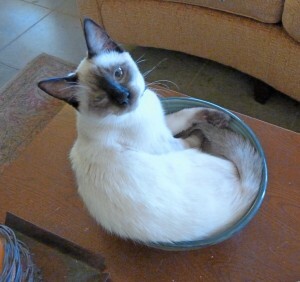 So today, I decided Sammy needed a bigger bowl. I happened to have one in the cupboard, so I put it out next to Sammy’s other bowl while he was snoozing. Let’s see what happened, shall we? 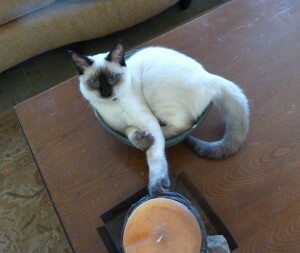 Definitely outgrowing the bowl. 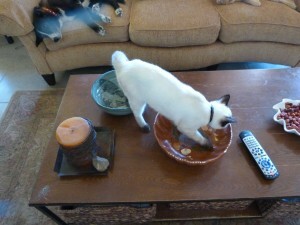 So I put down the other bowl on the coffee table. Obviously a smart cat. He can do two things at one time. I no longer have that ability. Nope. Not for him. Have no idea why, but let’s see what Samino has to say about it. 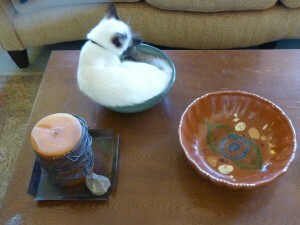 I left the other bowl out of the table because you just never know. But I bet my sinks aren’t safe. Going to a fancy, schmancy fundraiser tonight and a 10th anniversary party on Saturday. If you ever want to know what I’m doing, just check out my Appearances page. If nothing else, it’s good for a laugh. This entry was posted on Thursday, October 13th, 2011 at 11:50 pm	and is filed under Dancing Dog Ranch. You can follow any responses to this entry through the RSS 2.0 feed. You can leave a response, or trackback from your own site.